Expenses and invoices are extracted via API from your Expense Management System. Excel upload is also possible. After VAT rates are calculated by our backend algorithms and OCR technology, you will have online access to your VAT Reports. All charts are interactive and have drill-down capabilities. Manual Reconciliation, VAT compliance, and Submission to government tax offices until you receive your VAT refund. VaTax Cloud circumvents invoice format and missing data entry challenges by implementing Optical Character Recognition, or OCR. VaTax Cloud streamlines the Vat & Tax recovery process. We electronically retrieve your data and invoices from any travel expense management system or you can send us an extracted Excel file via our encrypted portal. You can be assured that no VAT claim will go unnoticed. Firstly, our backend algorithms and OCR technology ensure that even if you did not record your VAT expense correctly in your expense management software, we will pick it up and inform you. In addition, our VAT experts verify all claims before submission. We have saved our clients significant money, just with input VAT compliance, which we will do gladly as part of our service, with no extra charge, after signing. How does VaTax Cloud work? 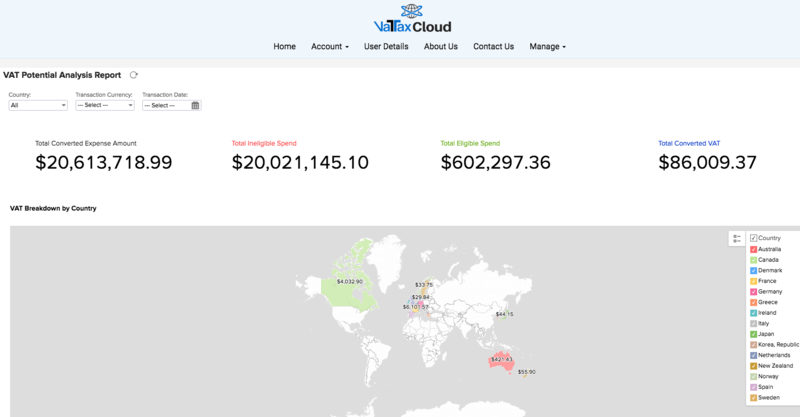 After sign up and login, VaTax Cloud automatically extracts your data from your expense management software and calculates VAT rates for each expense type in every country. You may choose to upload an extracted Excel file, if you prefer not to give access to your EMS. 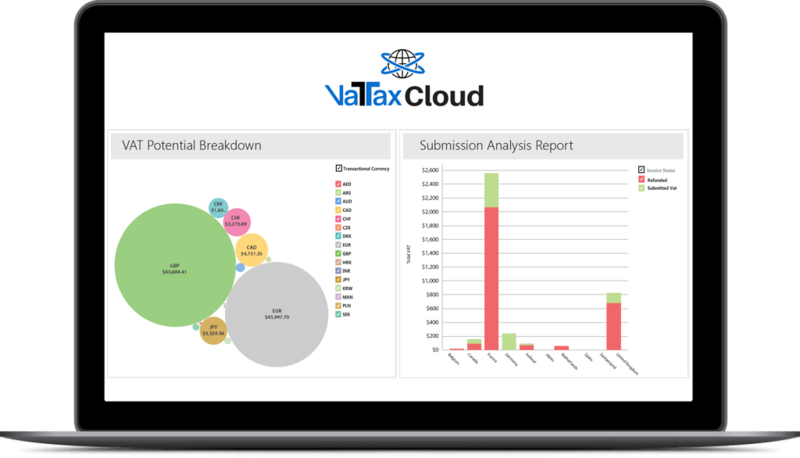 VaTax Cloud sorts scanned documents, utilizing OCR technology, capturing and calculating all your data from your expense management source. You will have access to detailed interactive Reports – VAT potential analysis report and Submission claim process updated in real-time. Quick sign up at VaTaxCloud Signup and then login after admin activation, and choose your extraction process. The simple instructions are clearly outlined. We are ready to assist you in any way. For manual extraction: Send us your extracted Excel file via your encrypted online dashboard, and VaTax Cloud will do the rest. Free potential VAT Reclaim Report? Our advanced VaTax Cloud application calculates VAT for each expense type, implementing the various rates within each specific country. VaTax Cloud generates detailed and focused reports so that you can ascertain every VAT expense. You will also get an overview of what you can expect to potentially reclaim for your VAT refund. Every chart is interactive and has drill-down capabilities so you can see every line expense that generated your report. Security and Access via VaTax Cloud? Our VaTax Cloud solution uses state of the art secure encryption technology to safeguard business confidentiality and employee data protection. We will also sign an NDA so you are assured of absolute privacy. Our extraction process provides read only access, so we can never alter the original files. We also offer the option of uploading Excel files, if you prefer not to give access to your expense management software. We will give you clear instructions along the way so the process will be simple and seamless. After extensive automated – backend algorithms, OCR – and manual reconciliation, we prepare and submit all the documentation to various government offices. You receive your refund as soon as we receive the reclaim. There is always a manual check system of all data to ensure maximal reclaim potential and discovery of any automated errors or incorrect data entry on your side. Will I see the progress? From invoice collection through the VAT & Tax recovery process, with the money ultimately being transferred to your account – you have full visibility – Submission Analysis Report – through every step of the process and the status of every claim filed within respected countries. Interactive charts with full drill-down capabilities are a click away on your reports via your encrypted online personal dashboard. VaTax Cloud has live interactive charts displaying VAT rates per expense type and country, submission tracking, receipts, currency reports and exception reports.